Increasing your cars performance is an urge that many car enthusiasts will get after owning a car for a long period. The list of modifications that you can do to your car are endless and thanks to online shopping, they can be delivered to your door next day. Factors such as engine size, turbo, gasoline or diesel and more determine your potential performance gains. Some car owners may even opt to improve their fuel economy as opposed to increase the power output. Before carrying out any performance upgrades, you should ensure that your car has been serviced properly, best brakes to stop your faster car, synthetic oil to ensure lubrication and all round good car health. 3.1 What is the Difference Between a Turbo and Supercharger? The most popular way to increase the power and torque output of your car is to either have it remapped or install a tuning chip. A misconception is that the two methods are the same but this is simply not the case. A remap involves a connecting the cars ECU via a diagnostic socket to a computer that is able to alter values in favor of performance. Variables that can be modified are air to fuel ratios, ignition timings, boost pressure and many others. There are no additional parts added to the car as a result of a remap, just a difference in software. A remap is a personal favorite of mine and the majority of my cars have been done. You will see more performance gains if you have a turbocharged engine compared to a naturally aspirated engine. Nevertheless, the small cost for large power and torque gains as well as improved throttle response is 100% worth it. Installing a tuning chip (or box) to your car usually involves connecting the chip/box to the common rail sensor. This has the effect of adjusting the amount of fuel that goes to injectors and engine. The box will remain there until you need to remove it. If you are installing additional performance upgrades such as below, you may even qualify for stage 2 or stage 3 remaps. Not only will an exhaust gives you a nicer exhaust note when accelerating but it gives an improvement in power. As cars get older, the exhaust cats usually get clogged up and performance slowly decreases. Therefore, installing a brand new stainless steel exhaust to an older car will see the biggest difference. A performance exhaust will usually be wider in diameter, thus allowing more air gases to escape, which increases power output. The best way to think of this upgrade is by blowing into a straw. The wider the straw, the more air you can blow down the straw. There are three options with regards to modifying the exhaust system and is dependent on your budget. Straight Pipe/Decat. A very popular method that involves cutting off parts of the original exhaust system and replacing with a stainless steel pipe. Exhaust sound will increase and more exhaust gas can escape. Performance Exhausts. If you are wanting to add value to the car and an improved exhaust note, then a performance exhaust is the best method. Exhaust Headers. The most expensive and last modification to the exhaust for the die hard enthusiasts. The exhaust headers is the connection between the engine and the exhausts and big performance gains can be seen from upgrading. A custom exhaust header is fairly expensive, so its not recommended for those on a budget. In short, more gasses that can escape quicker from the engine equals more power. Unless you have a high knowledge of car mechanics or have a reliable mechanic to carry out this modification, I would skip to the next. Adding a turbo or supercharger to a car is mostly advertised as a “bolt-on” kit but in truth, it still needs a fair bit of knowledge to install it correctly. What is the Difference Between a Turbo and Supercharger? In short, a turbocharger uses waste energy gases from the exhaust that goes to the turbo that acts as an air compressor. A supercharger gets air from the crankshaft of an engine that is connected to a belt, thus less efficient than a turbocharger. In terms of the difference when driving, a super charger will give power throughout the rev range whereas a turbo charger will give power at a certain RPM range. Less reliable with engine internals fighting high pressure and high temperatures. Either method you choose, the performance gains will be large. Always ensure that you have paid particular attention to engine cooling before installing either. 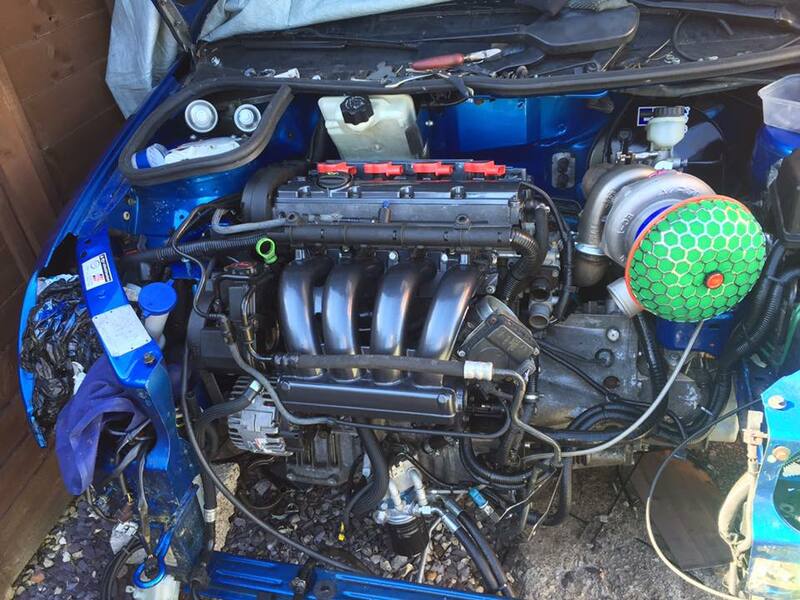 Probably the easiest of performance upgrades is installing a cold intake. Every engine will work better whilst sucking in colder air rather than warm or reused air. A cold air intake will be twice or three times larger than OEM parts. This gives the part more chance of pulling in more cold air. You can also increase the cold air intake by blanking off the EGR valve, which reuses hot air from the exhaust and pumps it back into the engine. Using the best spark plugs as a replacement for old burnt ones will see an instant improvement. The more air and fire, the more performance your car will provide. Genuine performance spark plugs are worth paying the small amount extra for a more powerful spark. An intercoolers main job is to “cool” down hot air that is within the engine. Cooler air is denser, which in turn improves the performance dramatically. Most modern cars will feature an intercooler but they are often small and not designed for other modifications that you may have completed. After installing a larger performance intercooler, we strongly recommend that you get your car remapped (again). Thanks for these tips to increase a car’s performance. I had never heard of a high performance intercooler before, but it’s cool to know that it can improve performance of a car very well by using cooler air. I’d be interested when this is ideal to install and for which type of cars, or if it’s a wise idea regardless of the model.